Vicente Berbegal, president and founder of the business group Actiu, was awarded the "Oro and Brillantes" award by the Chamber of Commerce in Alicante. 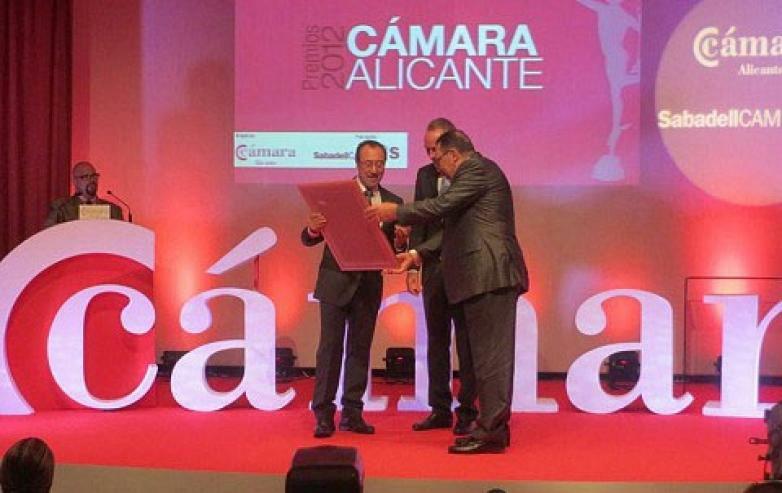 An award which was collected during the celebration "Night of the Alicante Economy" handed to him by the president of the Valencian Government, Alberto Fabra and the president of the cameral institution, José Enrique Garrigós, thus recognizing the work, drive and professional dedication of Vicente Berbegal ahead of Actiu. Vicente Berbegal is one of those ´self-made´ entrepreneurs. Before his twentieth birthday he had already created a society to manufacture components and furniture for the home. Two years later he went on to form his own company, Creaciones Berbegal, which would eventually evolve into Actiu Group today, culminating his great business project with Actiu Technology Park. He shared his business facet with the mayor of his town, Castalla. He was the youngest mayor in the history of the town and the first of democracy. With a high positive spirit, along his business career he said, “there hasn´t been any failures, only difficulties to overcome and decisions that have opened new roads”. One of his maxims, along his professional career has been to accept these difficulties as a learning experience and the crisis as an opportunity to grow. Berbegal appreciated the recognition which he considers as being given "for effort and the ability to adapt". Actiu began in 1968 and is currently one of the leading worldwide office furniture manufacturers for workspaces for sectors such as industry, contract, sanity, education, bank and airport spaces with presence in more than seventy countries and with a wide social and industrial compromise towards the environment. Proof of this is the LEED® Gold certification, received in 2011 for its sustainable building of Actiu Technology Park. With respect to the other awards that were awarded by the Chamber, the prize for commerce was given to Ilusión Bebé; the prize for Exportación to Cerámica La Escandella; prize for Tourism, Industry and Business Innovation for the hotel of Ibi Toys, Mármol Spain SLU; and Vitalgrana Pomegranate, de Catral, respectively. The award for Business Services to Orizon Sistema de Información and Family Business to Sirvent Almendras. Furthermore, there were two honorable mentions for Primitivo Rovira e Hijos and Bodegas Bocopa. Representatives from different business sectors of the province, as well as different public administrations and institutions were present at the ceremony which this year celebrated its thirty-ninth edition.